The Federal Reserve raised its key interest rate by 0.25 percentage point on Wednesday. It was just the third time that the Fed has increased rates since the financial crisis. That raises the Fed's target for short-term interest rates to a range of 0.75% and 1.00%. The move was widely expected after last week's strong jobs report and Fed Chair Janet Yellen's comments that a rate hike was "appropriate." A rate hike is a sign that the Fed is confident about the pace of growth in the U.S. economy. The Fed placed its key interest rate at 0% in December 2008 to resuscitate the collapsed housing market. But a little over eight years later, the U.S. economy is in much better shape and has grown, albeit slowly. "The simple message is the economy is doing well," Yellen said in a press conference. "We have confidence in the robustness of the economy and its resilience to shocks." The stock markets reacted positively to the move, with the Dow rising 120 points on the day. Yellen and other Fed leaders raised rates only one time each in 2015 and 2016, but on Wednesday they reaffirmed their commitment to raising rates faster this year. Fed officials project they will raise rates two more times in 2017, though it all depends on how the economy performs. The rate increase is a sign that the U.S. economy no longer needs as much help from the Fed and consumers and businesses can afford to pay more to borrow. America has added jobs for 77 consecutive months and the country's unemployment rate has fallen to 4.7%. The U.S. economy has expanded for over seven years, even though the pace has been slow. It's a vast improvement from 2009, when the unemployment rate peaked at 10%. However, it will increase the cost of borrowing. Home buyers and credit card owners should watch out. 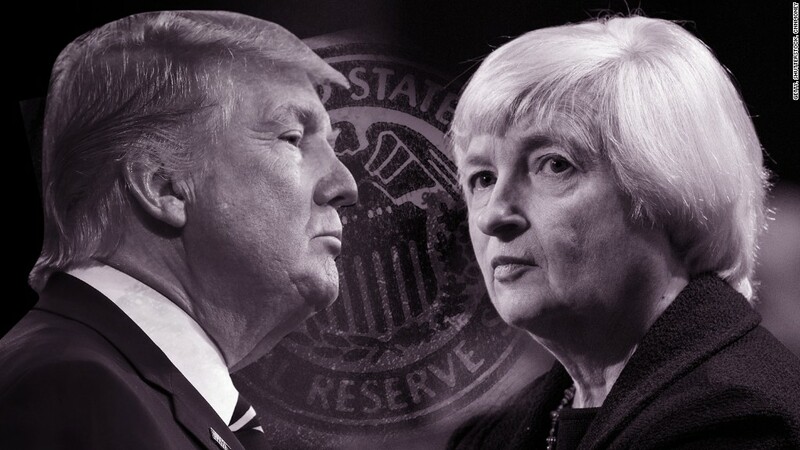 Yellen said she "was introduced" to President Trump in a brief meeting recently. She noted that the Fed's latest decision didn't factor in any of the expectations of growth stemming from the president's policy promises on taxes, deregulation and trade. Precisely how those play out remain a major uncertainty for the Fed. While experts caution that the policies won't take effect until 2018, the Fed must pay attention to how financial markets perform in response to news about the policies. Trump's potential reforms have already caused U.S. stock markets to rise to all-time highs. Expectations for his policies have triggered a significant increase in business and consumer confidence. But so far, the big boost in confidence hasn't translated to real spending. On Wednesday, the Census Bureau announced that U.S. retail sales -- a leading indicator of economic growth -- only rose 0.1% in February, compared to January. Related: Donald Trump's Fed: Same old Fed? The Fed faces another major uncertainty this year: Its own leadership. Three of its governorships will be open by April and Yellen's term as Fed Chair ends in January. Trump will have the opportunity to appoint to all of those positions. He was highly critical of Yellen during his campaign. However, Treasury Secretary Steven Mnuchin, a Trump appointee, has spoken kindly of Yellen and Fed leaders since he took office. Yellen too noted that she met with Mnuchin a couple of times and expects a "strong relationship" with him.